VIJAY'S MERSAL TEASER TO RELEASE FOR ATLEE'S BIRTHDAY? We know Mersal's teaser will release in a few days, but the makers have not announced when yet. While thinking about the possible dates, we got to know that Atlee's birthday falls on the 21st of September. Since we are just 8 days away from Atlee's birthday, we presume, the makers would be eyeing to unveil the teaser on that special day. It must be noted that the first look poster of Mersal was revealed on June 22nd for Vijay's birthday. To release the teaser on a random, why not do it for Atlee's birthday? This is just our view and let us wait and see what Mersal team has in store for us. Multifaceted T Rajendar held a press meet today, 13th of September in Chennai. While speaking at the event, he was asked if Rajini and Kamal would join politics, his reply was, "Rajinikanth is a very close friend of mine, similarly when super actor Kamal Haasan, had a problem during Vishwaroopam's release, I immediately sent my son Simbu to show my support. 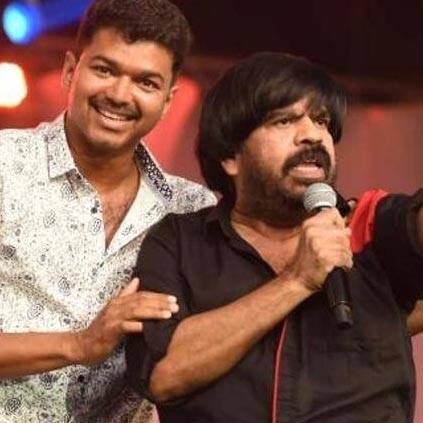 Likewise, when Thalapathy Vijay had an issue during Thalaivaa, the moment my son, Simbu got to know about it, he tweeted saying, 'Thamizha, engal anna, thalaivaa, I will be there for you no matter what problem it is.' Appidinu sonnadhu Silambarasan endra thambi ana Vijay illa Silambarasan ah nambi. That is why when Simbu had a problem during Vaalu's release, Vijay and his associate PT Selvakumar stood by us. That is why I ran in support of Vijay during Puli's release issue. I personally like Puli (Tiger). That is why I went to Puli audio launch function and gave that viral speech. So when an unknown face could enter politics why not films stars? Anyone from the movie industry can become a politician." Awesome news: Treat for film lovers and movie buffs! Hot: Riya sen's MMS returns leaked video goes viral. After GVM’s voice over, Goli Soda-2 will soon have..
Latest update from Vikram’s next action film! ''If you want to kill a film, go for it'', Vishal on negative reviews! Thalapathy Vijay Lights The Candle At Anitha's House | Paying His Last Respects!